I am presenting a webinar on BRM and Social Media on June 20, Friday at 11am EDT. To get a chance to discuss this topic with me and learn more, register here. I am an avid user of social media sites that exist out there, I blog, tweet, and I use Facebook. These social applications have been really useful to me personally. Facebook, for instance, is my way to connect with my family who live in the Philippines. Every time I post a picture of my kids on Facebook, I always have my family in the Philippines in mind. This is how I can share moments of my kids’ life with them. Through Facebook, I also keep track of my nephew and nieces. Early on, I realized the value of social networking to my personal life so I started thinking how such platforms extend to the enterprise. Even before the existence of full-strength Enterprise Network Tools available today, I wondered how such collaborative practices extend beyond personal use and find their way to become an integrated set of functional offerings that delivers business value. Think about an “enterprise Facebook”. What’s the equivalent of posting a status or photo? If I post about a project I am working on, blog about a business problem I am trying to resolve, or share a screen of a user interface mobile application I designed – what will it take for my peers in the office to be able to access, read and see them? To usher in adoption of the tools seamlessly is a challenge for those who have blazed the trail. If you can’t convince employees that using it will make their job easier or if you can’t convince business leaders that using it will create business value, it is tough to succeed. According to Forrester Research, organizations will increase their spending on enterprise social collaboration software at a compound annual growth rate of 61% through 2016. With the social software market now looking to be a hefty $6.4 billion part of the industry, every big player from IBM, to Oracle, to SAP are busy developing their offer. If you look at this amount of investment and demand, obviously the companies are seeing competitive advantage and value of social tools in their organization now and in the future. 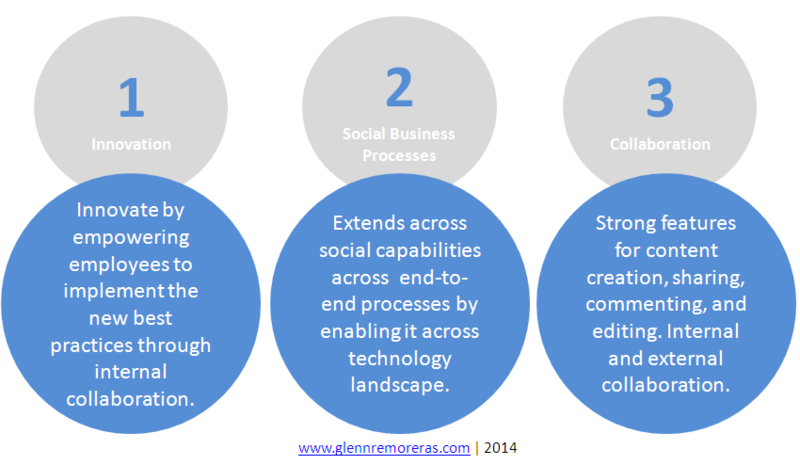 There are essentially three categories of benefits that can be derived from using social enterprise technology. So, broadly, we see that in order for social enterprise technology to create business value, it should not only provide strong content-centric features but also must extend social capabilities in execution of business processes and facilitating innovation through collaboration in the company. Companies who have embarked in the early adoption of social tools in the enterprise have done so to capture one or more of these business benefits. CEMEX, a multi-billion building materials company, initially began in 2009 to develop an internal social network which called Shift. Shift was designed to innovate and help make the company more efficient and agile by empowering employees to implement the new best practices they learn by collaborating globally in their business units. By building a collaboration platform accessible to employees throughout the company and around the world, CEMEX is empowering employees in new and important ways that go beyond traditional titles and roles. From the SAPPHIRENOW event in Orlando this June, I learned about how Kaeser Kompressoren uses SAP’s social enterprise application SAP Jam to streamline their sales and customer service processes and build a bridge from the first client contact through to the offer improving information and communications quality. They are leveraging integration between SAP Jam with seamless integration with SAP CRM module to join social capabilities and traditional work stream. You successfully change the culture, the way employees in a company collaborate, and you break geographical and political barriers. You optimize your enterprise work stream by having business processes accessible and executable through social interactions happening in the collaboration space. You bring innovation by empowering employees to organize around ideas that develop organically during social interaction.